WRAPUP: A beautiful night and a ton of fun at the races.. We had about a dozen MINIs show up to race or spectate. Chris E. helped get everyone get set and answered all our pre-race questions. We went out for a bunch of trial pre-runs before things got crowded and get an idea of what kind of times we would be running. Then we had a 6 MINI bracket race.. An elimination contest where you predict your finish time (that you are not allowed to surpass) and there is a staggered start such that a perfect run would yield a tie between the two cars. Winner of each round goes on to race someone else. The final race was a very close contest with Chris E. coming out just ahead of Jim M. A fantastic winners trophy was put together/donated by David L. This will become a traveling trophy for next year’s event winner. Huge thanks to Chris and David for this fun event!! 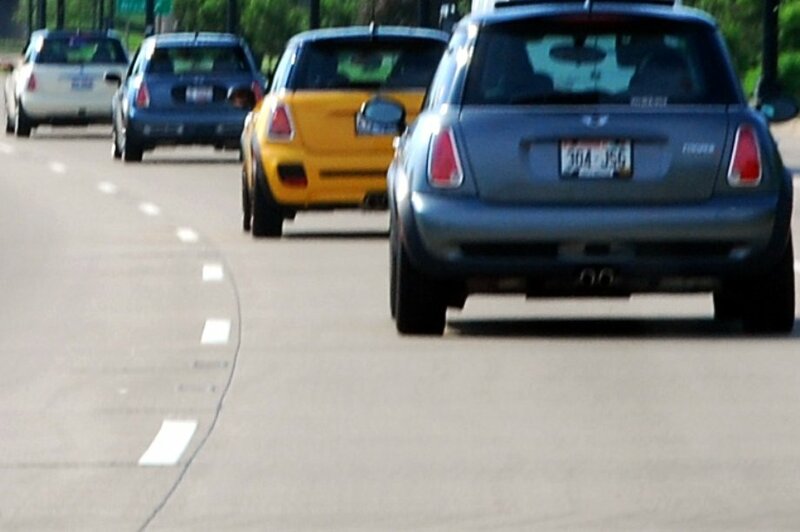 Knauz MINI has invited members of the Chicago MINI Motoring Club to participate in their 2014 Cruise Night on Friday July 18th. This is for older cars, but they will also provide a MINI Cooper area for our cars to gather and enjoy!! WRAPUP: Great weather and a great drive!! 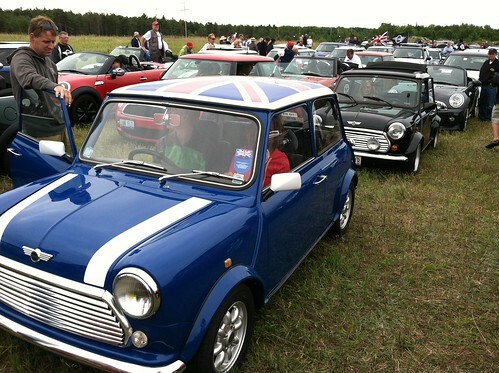 We had a large turnout of almost 30 MINIs of all colors and styles.. We had quite a few first timers who I suspect will be back for more drives. We took a fun and twisty route up around Lake Geneva and back. Huge thanks to Chris for all the route planning and and for taking the lead driving position on the route!! Send links to photos or video to steve@chicagominiclub.com and I’ll add it here. June 22nd will be a drive from the western suburbs, running thru some fun back roads including a loop around Lake Geneva and back. Here are a just couple area events that CMMC members will be participating in this year..
Use this space to add a comment to let people know you are attending, and perhaps you can arrange a meetup or group drive to get there..
Hi, this is Arnie Press VP-CMMC. 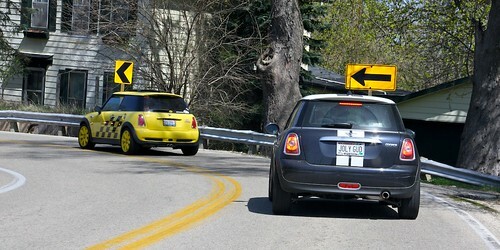 Lena and I and several friends as well as racers will be attending the Can-Am MINI Challenge at Mid Ohio 6/26-29. It should be one of the best Mini races in the country perhaps ever. Imagine 50+ Classic Mini’s racing on 3 wheels through almost every corner. I have attended other Mini/MINI races and found them to be very exciting and lots of fun. They are offering us FREE Club Parking and the price of admission is dirt cheap. We will be there Fri-Sunday. If you are from another Mini club or haven’t joined, you are still more than welcome to park with us and hang out. (M.I.N.I. Milw Mini’s etc…) JOIN THE FUN!Anyone who is interested or going please let me know so we can have club reserved parking and meet up.. The 2014 edition of our Spring Drive will be on Sunday April 27th. Come on out to the the official start of the MINI driving season. WRAPUP: we had over 50 MINIs attending from CMMC, MilwaukeeMINIs and Minis In Northern Illinois clubs. It was a very chilly spring day, but the predicted rain held off for the drive. We also had many new people out for their first club drive. A very fun ride thru Wisconsin backroads, ending with a stop at the famous Brat Stop. We’ll be joining forces with the MilwaukeeMINIs club and enjoying a fun drive thru Northern Illinois and Southern Wisconsin, ending with a late lunch in Kenosha.